The origins of this proverb are unknown, but they are relevant in varied contexts. One can say that the concept of plagiarism efficiently sits on this axiom. But there’s another saying too; “If you steal ideas from one source that’s plagiarism, but ideas stolen from more than one source makes the output a 'research. '” So, which one of these two proverbs should we apply when talking about plagiarism? Will it be literary theft? Or will it be fair to use? No doubt, the rules of plagiarism are vague. Although the subject falls under the umbrella of Intellectual Property (the IP), IP law does not directly prohibit the same. The two main branches of IP law deal with copyright and industrial property. Patents and trademarks fall under the later, and copyrights deal with the right of authorship. Strictly speaking, plagiarism cannot fall under the two types of IP. While plagiarism protects ideas, copyright law does not protect intangible expressions or idea. There are many ways of defining plagiarism. Imagine coming up with a plan, a story or a poem. After putting your heart and soul into it, and perfecting it, you put it online or maybe write it down on a notepad. A friend then comes along to steal your ideas, or someone on the internet copies your work, and they get praised for it. How would that make you feel? After all your hard work and dedication, you do not get credit for your creativity and originality, and someone else gets praised for the fruits of your labor. This aspect is the reason why norms on plagiarism are essential, namely to make sure the rightful author gets attribution and credit for their work. The Miriam Webster Online Dictionary defines plagiarism as literary theft and the stealing and presenting of another's ideas as your own, without crediting the source. The use of someone else’s expressions, work or even ideas without accrediting the source is plagiarism. The rules of plagiarism do not apply to information that is available in the public domain; they can be distributed freely and without any consequences. Some critics claim that plagiarising is all about attribution. Copying another’s work without attribution is plagiarism, even if the work gets specifically cited. The rules of plagiarism protect ideas, no matter how generic or trivial they may be. While plagiarism cases are common in schools and academia, there are plenty other instances where plagiarism is abundantly prevalent. No one is unaware of Madonna, the pop singer, and songwriter. She has gained huge success and has won several awards due to her edgy and catchy songs. But did you know that even the renowned singer and performer Madonna sparked controversy when media accused her of plagiarism? Salvatore Acquaviva, a songwriter from Belgium, accused Madonna of plagiarising part of his song “Ma Vie Fout L'camp” and using it in her hit song Frozen in 1998. The Belgian court upheld his claim, and Madonna was asked to withdraw her song for sale from the country. Another plagiarism case that came to the spotlight was that of a Harvard sophomore student Kavya Viswanathan. Miss Viswanathan was on a high when she got a book deal for her novel “How Opal Mehta got kissed, Got Wild, and got a life.” It wasn’t until a reader noticed striking similarities between her book and the novels “Sloppy Firsts” and “Second Helpings” by author Megan F. McCafferty. The reader notified Miss McCafferty of the plagiarism and Viswanathan was exposed. Although not expelled from Harvard, her book deal which was worth half a million eventually was withdrawn. Cases of plagiarism are not rare. In fact, traces of plagiarism can be found in almost every industry, from music to film to writing. A handbook stating the policy regarding plagiarism and its consequences by the University of Oregon was alleged and subsequently proved as directly copied from the Stanford University student handbook. Although defined as literary theft, people are still prone to take the risk, much unlike if it was thieving in the more traditional sense. Many famous artists have been known to plagiarise for their self-benefit by not crediting the source and gaining profit. The phenomenon is not a recent one and has occurred on numerous occasions. One cannot emphasize enough that the basis to avoid plagiarism is attribution. Even making small changes while leaving the underlying content intact is counted as plagiarism. Within academic circles, the ethical policy prohibits copying even the 'intangible' ideas. Plagiarism comprehensively protects Illustrations, facts, and concepts produced by an author. Crediting or attribution is the most comfortable and straightforward way to avoid plagiarism and its consequences. Acknowledging the source from which the information obtained and collected must happen carefully and precisely. It is also important to state the origin or place from where the text came through. Putting quotation marks when taking direct words and speech provides the suitable suggestion that the words belong to someone else and are not the source of the writing. 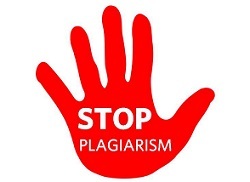 Plagiarism is despised because it allows the wrong party to benefit and sometimes gain profit that they have not earned. But some critics suggest that if the concept of fair use is applied, plagiarism can get overlooked. They argue that when accused of plagiarism, even before being found guilty, the person can suffer from huge loss. Their reputation suffers. Students accused of plagiarism are more often than not suspended or expelled from their school. Critics feel that the punishment is not fit for the crime. In essence, it cannot be considered as a crime, especially when the information obtained is in the public domain. Information available in the public domain is free to be used and published. But many people are unclear about this concept. When do they know if the data is genuinely in the public domain? These vague and ambiguous instructions make following plagiarism norms hard, especially for students. Furthermore, the intention of the plagiarist is a topic of debate. What happens when the plagiarism is unintentional, and the accused did not intend to deceive anyone or gain unearned profit? The essence of plagiarism is crediting or citing the source of the origin. It is all about acknowledgment. Although vague and unclear, it has become a norm in our society and one must follow the rules or face the consequences. Stealing someone else’s creativity and originality and presenting it as your own is off limits and should be treated sternly. However, in some instances, the rules must not be as severe. Always give credit to the real source. Regardless of their triviality or generic nature, plagiarism protects all ideas and expressions.